How Much is the Flu Costing the Workplace? Doctor showing the word Flu on a chalkboard. Photo courtesy of Shutterstock. Workers should do their best to avoid getting the flu, or else it could be costly. The 2012-13 flu season was one of the most severe in the U.S. in more than a decade and according to a new study, had two to three times the impact over a more typical flu season on the workplace, school, family and other segments of people’s everyday lives. A new report from Walgreens suggests U.S. adults missed 230 million work days last season, while children lost more than 90 million school days due to flu-related illness. By contrast, 100 million work days and 32 million school days were missed in 2010-11, according to the Walgreens Flu Impact Report. The term “germ-o-phobic” has become more mainstream in recent years, with the use of sanitizers on the rise and greater awareness around how germs and viruses can spread. 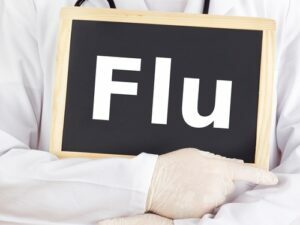 Nearly two-thirds of those surveyed (60 percent) say they will take extra precautions to avoid the flu this year, including washing hands more frequently (87 percent), getting a flu shot earlier (51 percent), getting flu shots for family members (49 percent), limiting time in public places (43 percent) and trying working from home more often (11 percent).